It's hard to believe that February has arrived already. What are your plans for this month? Around the Thistlebear home, February is the month when things start happening again. It gets warmer outside and we play outdoors more. We even begin making it to the park once in awhile. Plants begin to show signs of life in the yard; it should be only a few more weeks before we start seeing some tiny green shoots. A particular bush in the front yard will have tiny yellow flowers by the end of the month. I don't know what this bush is but we have three of them. This month I'm excited to be participating in my first-ever swap on Ravelry. I joined last spring, after I got confident in my crocheting skills. 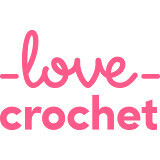 I love Ravelry and have learned so much there but I'm actually only in one group, a sort of fan club for Attic 24. We talk about Lucy's designs and share our ideas and projects, inspired by Lucy's work. The swap is meant to focus on "small pleasures" in life. 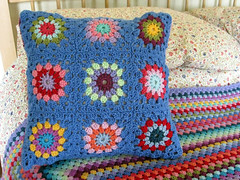 You need to send your partner a handmade item, a skein of yarn and any other little items you think they might enjoy. My partner is Canadian and she seems like a very nice person with varied interests. I'm already working on a handmade item to send to her. I think this swap will be a lot of fun. It was eight years ago this month that I learned the LB was on his way. I didn't know he was a he yet, of course. But that anniversary is actually tomorrow, Groundhog Day. We expected difficulties with conceiving and I remember my utter surprise at the positive test. My mother's birthday is on Valentine's Day and I will be sending her the heart decoration I shared recently. I haven't made many gifts by hand for her and I hope she likes it. I'll also be sending some chocolate from a store we have nearby that she doesn't have in her part of the country and I think she'll enjoy that. 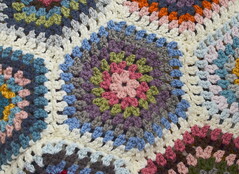 I'm continuing work on my traditional granny afghan for the family room. I had to put the work down for about a week while I was sick with the flu but I have picked it up again in the past few days. I've made a few more squares and I'm still really enjoying this project. I added a neutral tone to my original color palette. It's Vanna's Choice yarn by Lion Brand, and I think it was called Beige. I was distracted when I bought it. I had taken the GB with me to Hancock Fabrics to buy a few odds and ends; she was in grabby preschooler mode and I was getting frazzled. I had steered her over to their small yarn department and told her to help me find yarn that was "white or cream or tan," and that's the one we saw first. I think it's working out okay. This month, I'm very much hoping to find time to visit a local yarn store, Village Wools. The Bear gave me a gift certificate to this store for Christmas. I have just a few hours a week while both small Bears are in school and that would be a perfect time to do something like this, but I have so many other errands and chores that end up taking precedence. Sigh...I will go soon. I'm looking forward to seeing their yarns; they sell brands and fibers you can't buy at Hobby Lobby or similar stores. This weekend is the Super Bowl. We're not big football fans here at the Thistlebear home. We pretty much only watch the Super Bowl, actually. But we do enjoy that, especially because of the commercials. I have plans to make party foods for us: the time-honored Buffalo wings made with Frank's Red-Hot sauce, these pepperoni pizza balls I recently saw while tooling around Blogland and probably some chocolate-chip cookies. I'm enjoying the little potted daffodil bulbs that I bought earlier this week. The flowers have begun to open and they look very cheerful in my breakfast nook. February is starting off sunny and warm. I hope this bodes well for the month. We could still get plenty of cold and snow; in fact, we can have that kind of weather through April. But I'm loving this calm, bright morning. Here's to a beautiful and productive February. My birthday is in February so I always like this month. Your Superbowl snacks sound really good - I especially like the sound of those pizza balls. Yum. Well, happy early birthday! I hope you'll tell us how you celebrated. I'm looking forward to the pizza balls - I haven't tried them before but they shouldn't be too difficult and they sound really good to me. Sounds like lots of good things in February. I was told I would have trouble conceiving too and then *bam* I was pregnant with Emma. Yay! I'm so glad for you, Jenny. It was very stressful but it turned out I had a misdiagnosis and it wasn't a problem. Hi Teresa! Thank you, I appreciate the compliment. I have one more daffodil open since I took that picture and there's still one more to go. It's very cheerful!